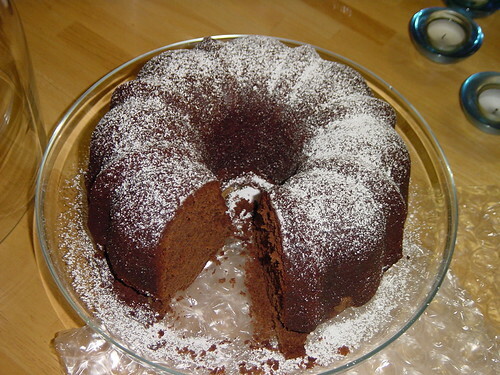 Chocolate Pound Cake, originally uploaded by in2jazz. This chocolate pound cake was an experiment from last summer. It turned very well and I added a dusting of powdered sugar. The next cake that I will experiment with is a chocolate tunnel cake. I have made the cake successfully once but have had a couple of failures with it as well. Stay tuned! Tonkatsu @ Yoshi’s in Oakland, originally uploaded by in2jazz. 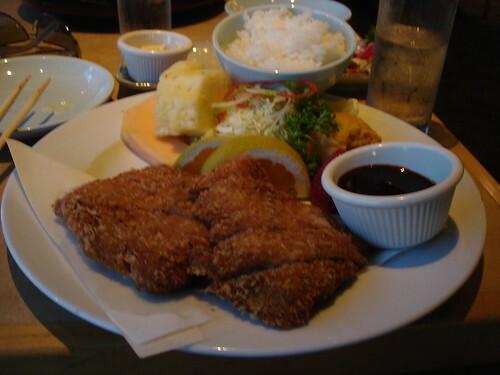 This was my favorite dish when I visited Japan. I have had it a few times since my trip. 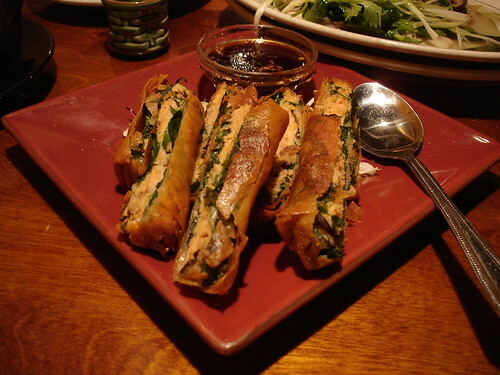 Salmon & Spinach Rolls @ Kirin, originally uploaded by in2jazz. Ye doro tibs @ Blue Nile Restaurant, originally uploaded by in2jazz. 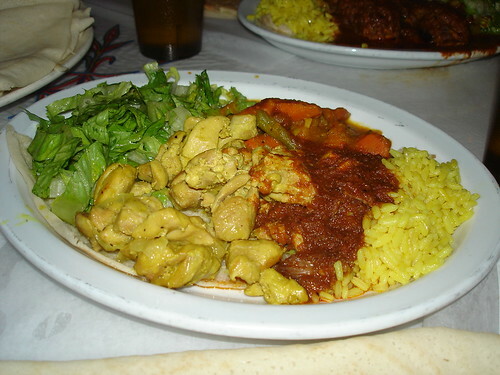 This was my first time having Ethiopian food. The injera is used to pickup the meal so no utensils were provided. Chocolate Shake, originally uploaded by in2jazz. 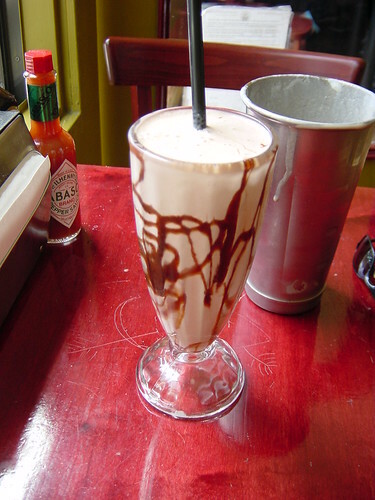 A very good chocolate milkshake at Burger Meister in San Francisco. Of course, I had this with a cheeseburger and fries. All were very good. Eli’s Cheesecake, originally uploaded by in2jazz. Taste of Chicago is an annual summer food event in Chicago. It runs for about 10 days from the last Friday in June until the 4th of July. The Taste celebrates its 25th year. There is tons of food, fun, and music during this event. 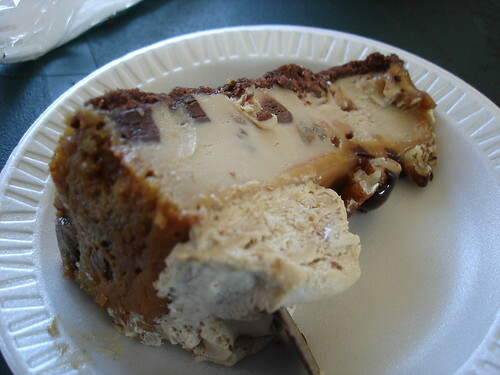 Here we have a tasty slice of Eli’s Turtle Cheesecake. Very tasty! 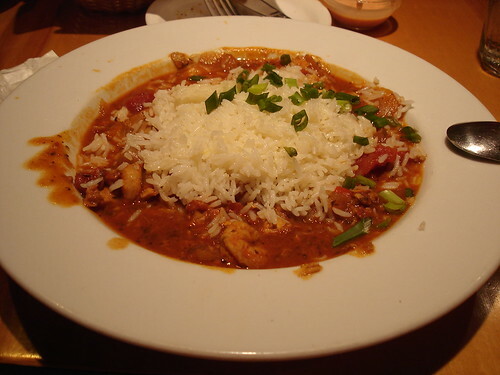 Spicy Jambalaya, originally uploaded by in2jazz. Spicy jambalaya at Tropix Caribbean Restaurant on Piedmont Avenue in Oakland. I had this along with the spicy cornbread and the fried calamari. After finishing most of the calamari, I could only finish half of the jambalaya. It made for a tasty lunch the next day. Shrimp & Grits @ Blackberry Bistro, originally uploaded by in2jazz. 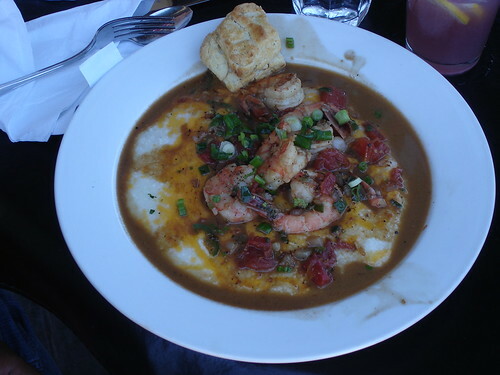 A very tasty breakfast of saut饤 shrimp, onions and tomatoes with lemon and green chilies over cheesy grits. I also had an order of chicken apple sausage and orange juice. Blackberry Bistro is located at 4240 Park Boulevard in the Glenview District of Oakland. It has been open since 2003 and become quite a popular spot for breakfast and lunch. The Bistro Burger is quite the bomb as well. Robert Dorsey III is the chef and owner of Blackberry Bistro. Before opening Blackberry Bistro, he was a chef for a variety of Bay Area restaurants including BayWolf. He has used his food prowess to great dishes and a wonderful environment for his restaurant. See you there soon! Here is the recipe for this tasty treat! You are currently viewing the archives for August, 2005 at Simply J Life.